PROPERTY developer Encorp Bhd, which currently has a total landbank of 107.36ha, is looking for more land in Malaysia and in the region. Executive chairman Datuk Seri Mohd Effendi Norwawi said the company is currently in advance negotiation to buy several pieces of land in Peninsular Malaysia while scouting for opportunities in Australia and the Asean region. "Our business development team is very busy reviewing various locations with potential for development in both local and overseas to expand our current land banks," he said. 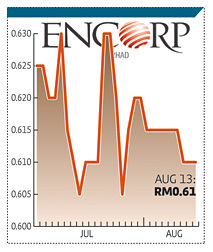 Encorp's property projects have a combined gross development value of RM3.4 billion. Effendi said with Encorp's achievements to date, the group is expected to generate a profit of about RM680 million over a period of five years. "However, we are in the process of looking at other prospective ventures that will enhance revenue, profit and sustainability in the coming years," he said. For this year, Encorp will be developing the integrated resort and international golf course in Cherating, the launch of Encorp Marina at Puteri Harbour in Johor and Encorp Ferringhi in Penang. "More future projects are in the pipeline in both Klang Valley and our resort home development in Cherating," he said in a recent e-mail interview. On the recent acquisition of land in Perth, Australia, Effendi said it will keep the group busy for the next five to eight years. Encorp recently bought a 11,000 sq m property in Perth for about RM18.54 million to be developed into a mixed residential and commercial project. The project will have a gross development value of A$13 million (RM42.77 million) with construction expected to begin in the second quarter of 2014 and completed by 2017. "Our maiden project in Perth has enjoyed good take-up rate and with this, we are looking for more opportunities in Australia. We are also exploring opportunities in other Asean countries," said Effendi. Its maiden project in Perth is named the Residences on McCallum Lane and was launched to investors in October last year. It is located in a prime location, close to Perth's central business district and is a 10-minute drive away from Curtin University, and 10 to 15 minutes away from University of Western Australia. Back home, Encorp's major land- bank include the 18.24ha for its Encorp Strand project, 84ha of its Cahaya Alam project, 1.32ha in Johor for the Puteri Harbour project and 2.32ha of land in Batu Feringghi, Penang. KUALA LUMPUR: KLCC Property Holdings Bhd posted a net profit of RM91.6mil, or 9.81 sen per share for the second quarter ended June 30. Its revenue stood at RM288.6mil during the quarter. For the six months ended June 30, KLCC Property posted a net profit of RM193.1mil on revenue of RM564.4mil. On March 2, KLCC Property announced the change of financial year-end from March 31 to Dec 31 beginning from April 2011. As a result, there is no equivalent comparative quarter. KLCC Property’s pre-tax profit of RM184.4mil achieved in the second quarter was up by RM2.5mil or 1.4% higher than the preceding quarter mainly due to improved operating profit. Its revenue of RM288.6mil for the second quarter increased by RM12.8mil when compared with the preceding quarter attributable mainly to the higher revenue from hotel, the Menara 3 Petronas office and improved revenue from retail segment (Suria KLCC and Menara 3 Petronas). “The directors are of the view that the results for the remaining 2012 period will remain stable due to long-term office tenancies and expected improvement in retail occupancy. The hotel segment will continue to trade in a competitive environment,” it said in the notes accompanying its financial results. The shares of Eastern & Oriental dived after the Securities Commission said it's investigating trading related to the stock. EASTERN & Oriental Bhd (E&O) lost more than RM400 million of its market capitalisation as nervous investors sold shares of the property developer after the Securities Commission (SC) said it's investigating trading related to the stock. From the word go, E&O shares were in negative territory, opening the trading session some 33 sen lower at RM1.57 sen a share. 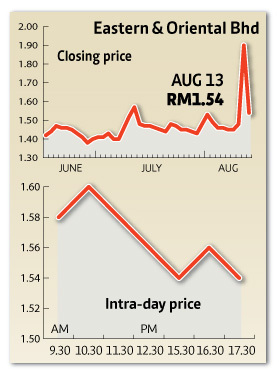 It ended yesterday at RM1.54 with 24.8 million shares exchanging hands. CIMB, in a research report yesterday, had advised investors to wait for the shares to drop to the RM1.50 level before they start accumulating the shares again. Dealers said that the report helped stymie panic-selling in E&O's mother share, but it did not translate to the E&O call warrants, which had a free-for-all selldown. The E&O call warrants, which expire at the end of this month, opened the trading day some 81 per cent lower at three sen. It ended the day at 3.5 sen per call warrant with some 30 million call warrants traded. Just last Friday, E&O was among the most sought-after stock on the exchange, with investors chasing the shares up to the maximum limit-up level, following a Web-based news portal's report that the SC will order Sime Darby Bhd to make a general offer for the E&O shares which they do not own. A year ago, Sime Darby had bought some 30 per cent of E&O, a niche based high-end property developer from Penang. The report said that the decision was made after a review by the commission's leadership under its new chairman Datuk Ranjit Ajit Singh. However, the same evening, the SC released a statement saying that its position on the general offer requirement remained unchanged as per its statement issued October last year, which said that Sime Darby does not have to make a general offer for the remaining shares in E&O. The regulator also added that it has started examining the trading activities associated with the relevant counters arising from the rumours. PETALING JAYA: Independent adviser Affin Investment Bank Bhd has advised minority shareholders of United Malayan Land Bhd (UM Land) to accept the takeover offer of RM2.50 per share by Seleksi Juang Sdn Bhd (SJSB) and parties acting in concert (PAC), who hold a combined 77.52%. It said yesterday the RM2.50 offer price per share was fair and reasonable, as it was a 13 sen premium to the closing market price of RM2.37 on July 11, which was the last trading day prior to the takeover notice. Affin Investment Bank also said UM Land's shares had not traded at or above the offer price for the past five years. “Holders should note that there is no assurance that the market price of the UM Land shares will remain trading at this level in the future,” it said in a circular to shareholders. The stock traded at an average monthly volume of 881,758 shares, or 1.30% of the free float for the past year leading up to the offer date. Affin Investment cautioned the minority shareholders holding the remaining 22.48% of UM Land that the illiquidity of the shares may impact their ability to realise their investment in the open market. It said as SJSB and the PAC held 77.52% of UM Land's total issued shares, irregardless of the level of acceptance of the offer, the company did not comply with the public shareholding spread requirement. SJSB and the PAC plan to delist the company from Bursa Malaysia Main Market. Due to the fact that as at the date of notice, both SJSB and the PAC collectively held more than a 50% stake, the offer is not conditional upon any minimum number of valid acceptances of the offer shares being received. If the company is delisted, its shares will no longer be able to be traded. “Holders should note that they may not be able to realise their investments at the same consideration under the offer and may encounter difficulties in disposing them,” Affin Investment said. The offerors intend to privatise the company in order to have greater flexibility to plan and execute long-term business opportunities. It has a number of projects in the pipeline, which comprises of township and niche developments. UM Land expects its township developments to contribute to earnings in the long term, as it requires an extended period of time. This may affect the company's ability to pay dividends in the future. The company has been paying dividends for the past five years. It adopted a dividend policy of a 25% payout ratio, effective financial year ending Dec 31, 2012 (FY12). As dividend policy is subject to availability of future investments and cashflow position of the company, there is no assurance to shareholders that the payout ratio will hold at the same level. UM Land had announced on July 12 that had it received a takeover offer from SJSB and the PAC to buy the remaining 22.48%, or 67.81 million shares, not already owned by them for a cash consideration of RM2.50 per share. Analysts had said that it was a good deal for the parties offering to buy out the company as the offer price represented a discount of about 18% from UM Land's net asset value per share of RM3.04. In the first quarter ending March 31, UM Land posted a lower net profit of RM136,000 compared with RM13.97mil in the same period last year. Revenue had also fallen to RM51.6mil from RM82.2mil previously. UM Land shares closed at RM2.49 yesterday.